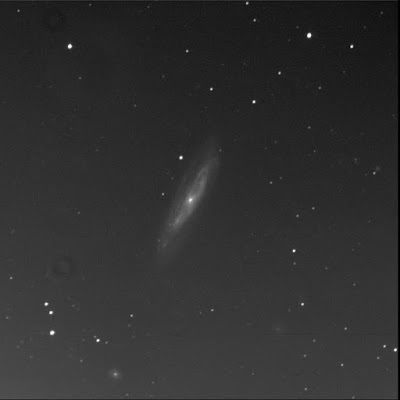 The BGO aimed at Messier 98 for me. A large spiral galaxy in Coma Berenices. Viewed only once before (on 19 May 2012). The wonderful nearly edge-on galaxy also known as NGC 4192 looks distorted, particular to the north. Something interfered with it in the past, bending and flexing it. It almost looks like two discs parallels. I can see multiple arms and concentrations of stars within. There seems to be an inner region that is much brighter. Compact and intense core. Quasar Q 1210+1507 is easy to see. It is to the west of the spiral, in an equilateral triangle with stars J121314.4+145000 and J121307.6+144902. To the south-west of the galaxy, well away, is a round dim patch: MCG 3-31-76. Just to the north of this is a tiny dim oval: LEDA 1467279. NGC 4186 appears to the south-south-east, a nearly face-on spiral, small, with a large bright core. I can see still more galaxies in this image... Busy place!